It seems that nobody is buying the new Chevy SS. Maybe that's because of cars like today's Nice Price or Crack Pipe '95 SS, which just so happens to rock a six-speed. Check it out, and see if its price has you thinking this SS is a super star. Unsurprisingly, yesterday's custom 1995 Miata wasn't fooling anybody, fulfilling its intention of looking like a 246 Dino about as well as did Katy Perry's halftime dancers' in their attempt to appear like real sharks. For $16,500, This 1995 Mazda Miata Will Let Your Dino Soar! That, and a pretty hefty buy-it-now resulted in one of the more overwhelming Crack Pipe losses - 96.87% - that we have ever seen. Ninety six point eight seven! Well done, men and women of taste and decorum! Okay, let's get off the weird wagon and into something I think we can all agree upon is worthy of our attention, and perhaps even our monies. Whether you have fond memories of a good portion of your youth spent in the back seats of cop cars, or just appreciate the expansiveness of cars that once expressed the American ideal, you will no doubt feel some pangs of lust toward this 1995 Chevy Impala SS. It looks good and comes with a stick, a feature that's apparently harder to find on the new SS than people in Seattle willing to let Pete Carroll be their life coach. The venerated SS badge returned to the Impala in '94 after about a quarter century's absence, and those '94-'96 editions brought along the goods to back up that badge. That meant starting with Chevy's 9C1 police package as a base and then massaging it with a more sporting tuning of the suspension, a handsome set of simple five-spoke alloys, and an LT1 V8 derived from that of the Camaro. That 350 V8 was good for 260bhp from the factory, and it wasn't quite as fancy as the LT1 used in Chevy's coupes, lacking aluminum heads and 4-bolt mains. Still, you can't go wrong with a 350. This SS goes even more right by backing up its small block with a T56 6-speed stick that the ad claims was professionally installed. That should give your right hand something to do on the drive other than just scratching your nuts or copping a feel from your passenger during stop-shorts. Other mods to the car include a 4.56 rear end, which should make highway driving a bit of a rev fest, a custom driveshaft, and what's said to be an upgraded heavy duty suspension. There's no word on how many miles the car sports overall, but the ad does note 20k on the driveline improvements. Visually, the car doesn't evidence any major issues. 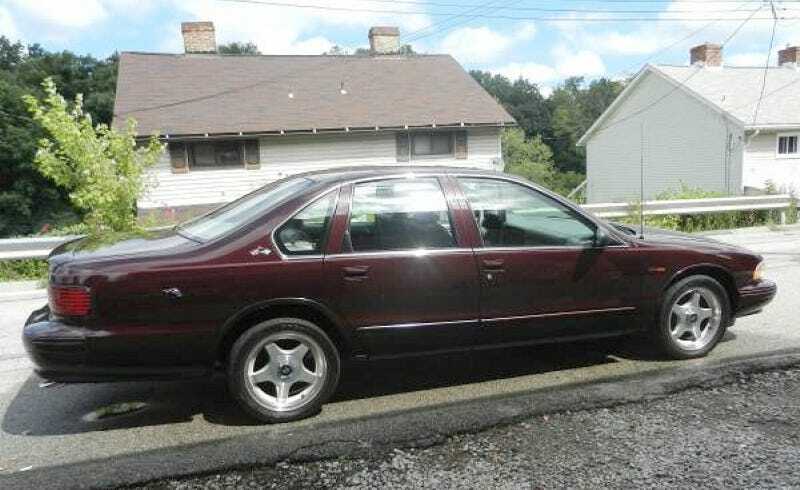 The dark cherry paint still seems to hold a shine, and the car rolls on its factory alloys. The nose piece surrounding the grille is now flat black instead of body color, a change I don't think I'mfully behind, while there appears to be some extra badging here and there that also might want to be addressed. Under the hood, the air intake has been modded with a K&N tube as such things often are, and there's so much red loom wrap on it that the mill looks like something that might attack Neo in the Matrix. Other that that, it's pretty tidy. There aren't any good pics of the interior, save for one shot of the shifter, but that at least does make it look like some thought went into its installation. Also, stereo head unit, while not the OEM piec,e looks joyously old-school in its silver face. The car is said to have a clean PA inspection until the middle of the year, and does sport Classic Vehicle plates which, I don't know, don't quite seem right on a car like this. What you need to determine is - based on the ad - whether this car's $8,800 price tag seems like a fair deal. What do you think, is that a good price for this Impala? Or, is that too much scratch for even a 6-speed SS? Pittsburgh Craigslist, or go here if the ad disappears. H/T to jerbearz06 for the hookup!